Castleford held on to seal a seventh Super League win of the season despite a thrilling Wakefield comeback. James Clare broke the deadlock for Cas while Jesse Sene-Lefao scored the hosts' second try of the match. Cory Aston scored a debut try after Clare found a second while Mason Caton-Brown scored on his Wakefield return. Greg Minikin and Caton-Brown exchanged tries before Wakefield fought back through Joe Arundel, Ben Reynolds and Tinirau Arona to set up a tense finale. The result keeps Castleford and Wakefield in third and fourth place in the Super League table respectively, but Cas claw down second-placed Warrington's four-point gap to just two with the win. 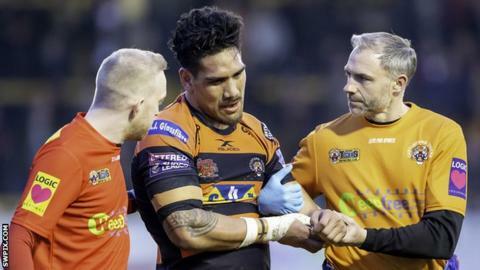 The hosts suffered a blow just before the midway point of the first half when Sene-Lefao sustained a badly dislocated shoulder in the process of scoring Castleford's second try and was forced off. Caton-Brown found a consolation try for Wakefield towards the end of a first half in which they struggled to gain a foothold against a dominant Castleford. The winger re-signed with the visitors earlier this week after a spell with Toronto Wolfpack last season and made an immediate impact in either half as Wakefield enjoyed an uninspired comeback in the second half. Ben Jones-Bishop came within inches of scoring a dramatic 77th-minute try that would have surely won the game for the visitors, but he was held up by a tremendous Peter Mata'utia tackle. "For the first 50 minutes we were outstanding, Our young half-back pairing handled things really well and some of the things we did were as good as we've seen for a long time. "When the momentum changed, you could almost feel the nervousness in the team. They got back at us and we did well to hang on in the end. It was an important win for us. "Our injury list at the minute is pretty ridiculous. I know Wakefield are doing it tough as well but we lost two boys which made rotation difficult." "We've lost another close one. I hate coming to this place. It was a missed opportunity tonight. I thought we actually started the game well, for the first 10 or 12 minutes, but it went downhill from then. "I don't know if Cas were good or we were poor. We had no real intent defensively, we were dropping off contacts and big [Liam] Watts ran amok. "I'm frustrated. It was probably the worst 40-minute performance from us this year. We probably gave them too much respect and we gave ourselves way too much to do. "They were down to two interchanges and I thought we had a chance but we were our own worst enemies. We could have nicked it at the end but I don't think we deserved to get anything out of tonight." Castleford: Mata'utia, Clare, Minikin, Shenton, Eden, Trueman, Watts, Holmes, McMeeken, Milner, Massey, Sene-Lefao, Aston. Interchanges: Moors, Clark, O'Neill, Smith. Wakefield: Hampshire, Lyne, Jones-Bishop, Fifita, Wood, Ashurst, Kirmond, Arona, Arundel, Jowitt, Crowther, Caton-Brown, Reynolds. Interchanges: Kopczak, Hirst, King, Pauli.